On Sunday, while hiking along a dry creek bed on the northwest corner of Mount Diablo, Kieran found, among other things, a swarm of tiny red ants with black gasters. They were pouring out of their nest, which was dug right in among the boulders of the dry creek (Little Pine Creek). Several winged reproductives (queens and males, who fly up into the air to mate) were mixed among the workers. Though they were tiny, just 3 or 4 mm long, the size of our drab brown invasive Argentine ants, these had a powerful, burning sting. We brought home a half dozen workers in a tube and today I finally got out our stereo microscope to try and identify them. Now this sort of work ain’t at all easy. Using needle nosed dissection forceps, I rotated and examined the workers under the ‘scope, trying to sketch their body features. To identify ants you look at the shape of their head, count the segments in their antennae, observe the formation of their petiole or “wasp waist,” and also look at other features that require greater magnification than our microscope provides. My “needle nosed” forceps aren’t needles under the microscope, either! They’re great, blundering things, big as the ants themselves, making it hard to grab a leg and rotate the ant’s body, for example. I tried using a metal probe with a point to open an ant’s mandibles, but couldn’t manage it. Once you’ve sketched all the relevant features, then you crack out your books. 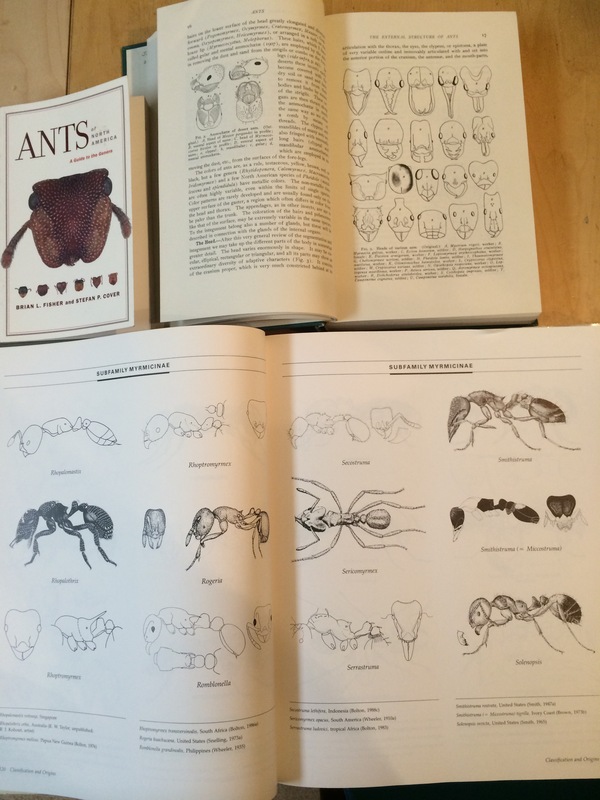 I’ve got plenty of great ant books — by Wheeler, who was Harvard’s great “ant man” a century ago, by Wilson, Harvard’s recently retired great “ant man” of recent times, and by Fisher and Cover, who wrote a very handy pocket sized book — Ants of North America: A Guide to the Genera. But even with all that, it’s difficult. 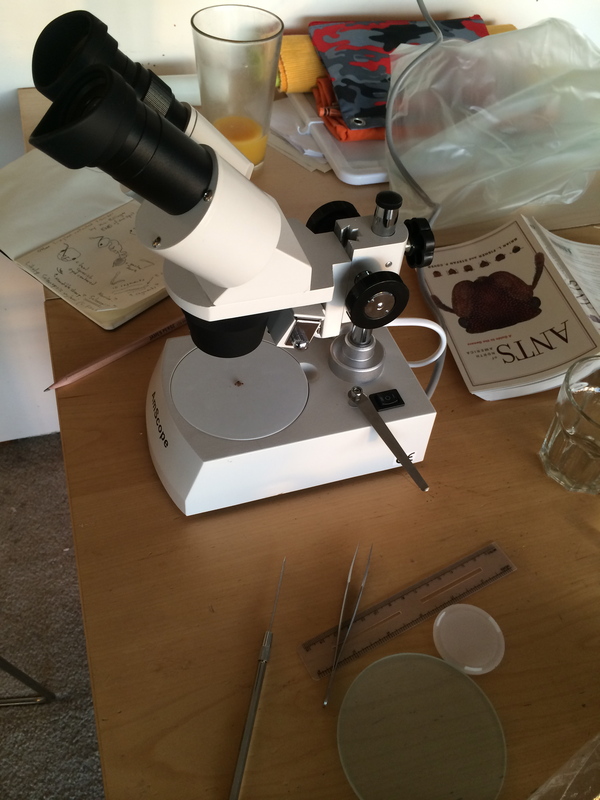 After blundering about, I narrowed these specimens down to a surprising genus — Solenopsis. Why is that surprising? Because those are the notorious fire ants of the South! I didn’t know we had them in California at all. Seems likely these aren’t the famously fierce (and famously imported) Soleopsis invicta, but rather a moderately fierce cousin, Solenopsis xyloni. Still, nothing should surprise me anymore. Last year Kieran found some curious reddish swarming ants in Briones, ants that behaved in a curious way, bubbling up out of a hole in the ground like lava. Turns out, after we put some under the microscope, that they were in the genus Neivamyrmex. That means nothing to you, probably. But they’re army ants! Tiny cousins of the giant Eciton army ants in the American tropics. They march around in swarms, just like the army ants you’ve heard of, except our local species tend to stay underground as they march about, so we hardly ever meet them. You learn something new everyday. If you’re lucky. That tiny reddish dot under the microscope is a pile — yes a pile — of five or six ants! 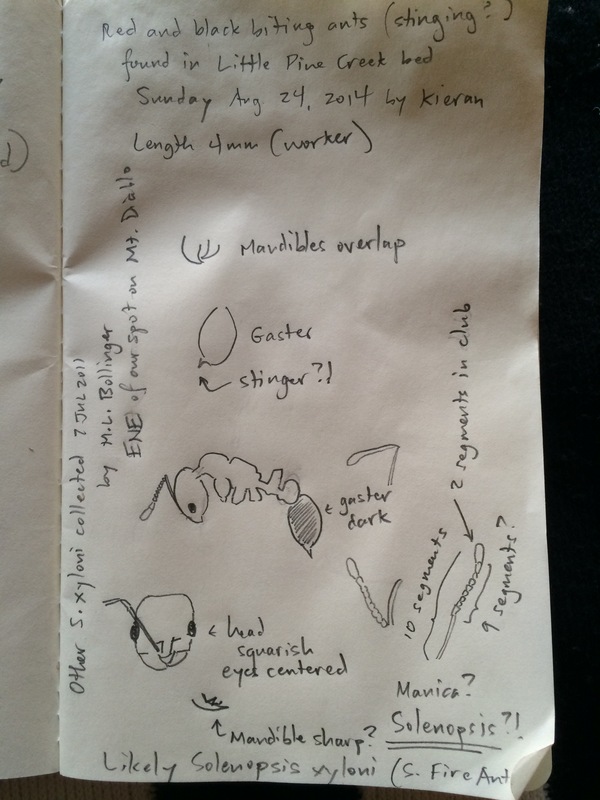 My notes and sketches after examining the ants under our microscope. We’ve got some wonderful ant books. But even that ain’t enough for an easy ID.